My baby girl turned one on Friday. I’m still trying to get my head around that fact! It’s been a funny old year. In some ways the time has sped by – it felt like we’d barely come home from the hospital and suddenly she was 6 months old and ready to start solids! But at the same time, it feels like so long ago that I was telling Steve to go get the midwife because Nerys was on her way! I can barely remember what life was like before she came along. 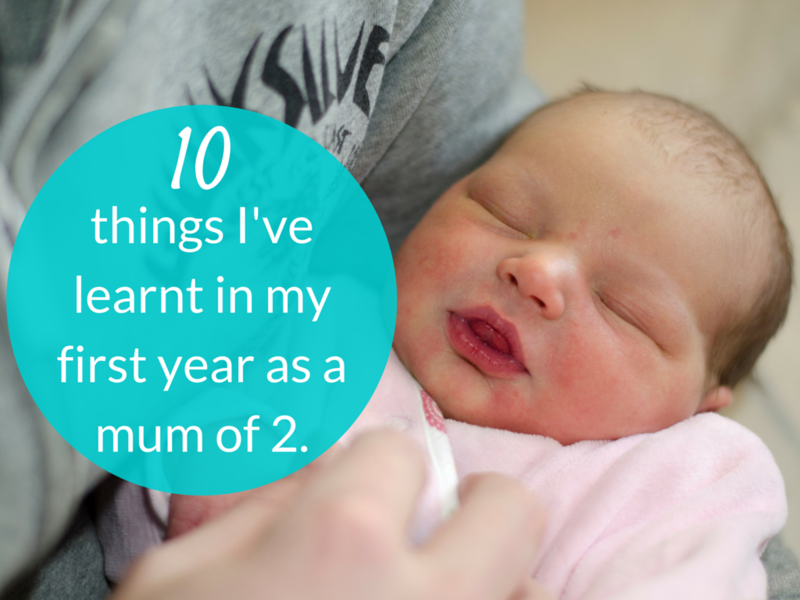 I really feel like we’ve all changed and grown a lot in the last year, and here is my list of 10 of the things that I’ve learnt in my first year as a mum of two. I can survive on very little sleep. I got really lucky with Nerys when she was a small baby. After the first few weeks of being up all night with her feeding almost non-stop, she started sleeping really well. Up until she was four months old she would sleep for a good 6 or 7 hours straight most nights. I was so grateful to be getting so much sleep but at the same time I just knew it wouldn’t last! Sure enough, at four months she hit her first sleep regression and just never really recovered! Now, on a good night, she’ll only wake twice. On a bad night, she’ll wake roughly every 2 hours. On a really bad night she’ll wake roughly every 2 hours then will start a tag-team with Rhys to wake every half hour from about 5am. There have been days that have been a real struggle. Where I’ve had several cups of coffee and far too much chocolate and biscuits. Where I’ve lost my patience way too easily. Where I’ve sat and cried because it’s all just a bit too much. But most days, even though I’ve had so much less sleep than I really need, I can cope. Once I’ve had that first cup of coffee in the morning I’m good to go. I can get Rhys to school safely and on time. I can manage to feed and water both the children and even cook a proper dinner for me and Steve. I can actually enjoy the privilege of being home with my children. I do look forward to a time when I can have a full night’s sleep again though! I’m very lucky to have my husband. I think part of the reason I’ve been able to survive on so little sleep is that, just as I’m about to reach breaking point, the weekend rolls around and my husband can take over for a while so I can go back to bed! Single parents honestly have my utmost respect. I can’t imagine doing this all by myself. I know I’m very lucky to have a partner in this; someone to pick up the slack when it all gets a bit much. And, at the end of a long day like today, I’m lucky enough to have a few minutes to sit and write this in peace while he puts the kids through the bath. I am very grateful to him for everything he does for us. About a year and a half ago I took the plunge and bought a slow cooker. I kept seeing recipes for cooking all sorts of things in a slow cooker – my Pinterest feed was full of them! And I was intrigued. I was also hopeful that having one might help make evenings easier. I’m happy to report that it really has made things easier! Right now, for example, I have a really tasty carrot and lentil soup cooking away. Made with stock that my husband made in there last night, which was made from the chicken we cooked in the slow cooker on Sunday! We’re really getting our money’s worth from it! And I know I’ve only scratched the surface of the things that I can cook in there. I’ve got a Pinterest board started dedicated to all the amazing things that I need to try! I’m more relaxed about certain things. 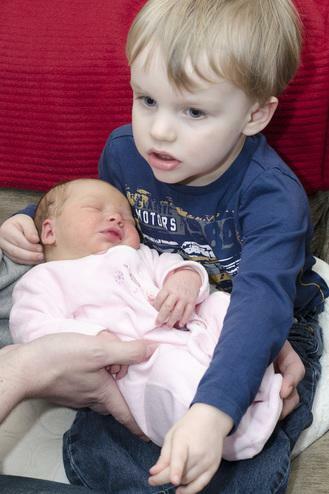 When Rhys was a baby I was much more uptight about things (although I probably wouldn’t have admitted it at the time!). I didn’t really give him chocolate for ages. He did have biscuits but they were the ones made specifically for babies. I was really on edge when he started cruising (and then letting go of the furniture because he thought he could walk by himself). Second time around, I do feel more relaxed about these things. Nerys already loves chocolate and I’ll quite happily hand her a digestive to munch on. And I was much less stressed when she started walking, safe in the knowledge that she may well fall but she’ll jump straight back up again and give it another go! I’m more anxious about other things. Weirdly, while I think I’m more relaxed on the whole, there are things that I’m more anxious about. When Rhys was ready to start on solids I was really set on trying baby led weaning with him. It worked really well for us and I was really quite relaxed about him eating finger foods at 6 months. With Nerys on the other hand, I’ve been really quite nervous! We’ve weaned the traditional way with her, with purees and then finger foods on the side. But I’ve been much more on edge about her choking. I’ve only recently let her have raisins! She absolutely loves them and I feel a bit bad about not giving them to her sooner! This knowledge is absolutely what is keeping me from getting really down about the disturbed nights. When you’re in a bad stage with your baby/toddler/child it feels like it’s going on for-ev-er! At least now, the second time round, I know that things do eventually get better, and before I know it the sleepless nights will fade in my memory (I really hope so anyway!). Another thing that has really helped keep me sane over the past year has been having friends who are going through the same thing as me. From my little group of ‘baby-group’ friends, quite a few of us now have a second child.. It’s been a huge help to be able to chat honestly and openly about how hard it can be juggling a 3 year old and a baby, knowing that the others are experiencing the same struggles and not judging me when I complain! You can’t plan everything but it does help to be organised. Since the day I went into labour with Rhys and my (admittedly vague) birth plan went out the window, I’ve realised that you really can’t plan much when you have kids. Well, you can plan, but you have to be open to the idea that your kids will probably have other plans! I’m convinced they know when I’ve planned to shower during nap time and so decide to fight going to sleep with all their might! What helps me with this feeling of potential chaos is trying to be as organised as I can. I feel much better when I’ve actually managed to get clothes ready and bags packed for the next day the night before, so there’s less of a manic rush in the morning before school. Your children can be so similar in some ways and so different in others. My children are definitely siblings. There’s really no mistaking it when you look at them! And in lots of ways they’re very similar. 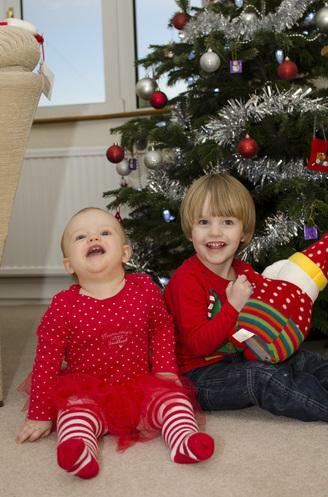 They were both desperate to be on the move and walked around the 11 month mark. They are both very determined. They both love ‘wind the bobbin up’! But there are definite differences too. Rhys was 2oz bigger at birth, but once we started weaning didn’t have a huge appetite for food. Even now he doesn’t really eat a huge amount and is a very average size for his age. Nerys on the other hand seems to rather enjoy food and is currently on the 99th centile line on the growth charts! She’s tall for her age as well – she’ll definitely end up taller than me! You have to do what is best for your family and your sanity. Even if it goes against all those things you swore you would never do! I was never really comfortable with the idea of co-sleeping, and we never needed to bring Rhys into our bed, but Nerys has come in on several occasions. Sometimes you do whatever you need to do so you can all get some sleep so you can function the next day. Any parents out there with 2 (or more!) children, do you feel the same way? !